Muskerry News | Con O Riordan Blarney United 1967 – present day. A truly remarkable journey in football by a remarkable Blarney man! Con O Riordan Blarney United 1967 – present day. A truly remarkable journey in football by a remarkable Blarney man! On a beautifully sunny Summer’s day the current Blarney United senior team, a mix of ex-players, supporters, friends and family turned out at O’Shea Park to celebrate with Blarney United legend Con O’ Riordan on his successful battle against cancer. Con had been diagnosed with prostate cancer earlier this year and after months of treatment and worry Con recently got the great news that the treatment had worked. 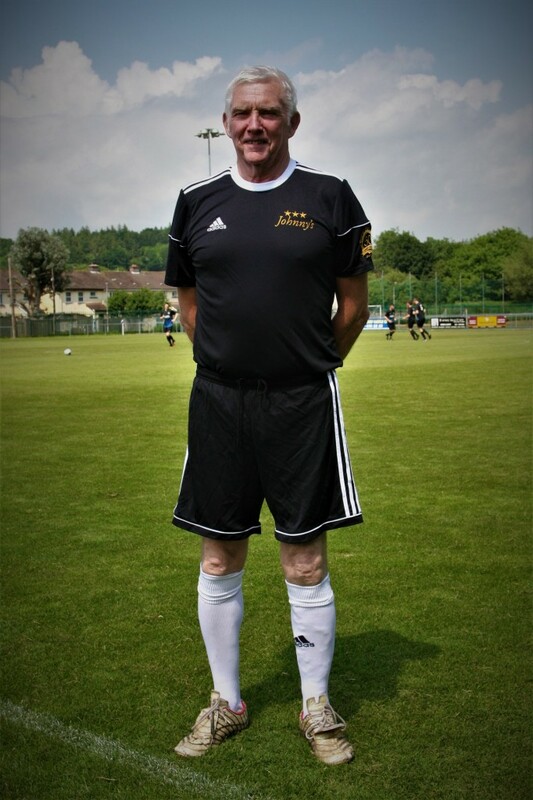 It’s a great relief to Con and everyone associated with the club that he won this battle with cancer and the support of his family, friends and everyone at Blarney United played a major role in Con making a full recovery and continuing his duties with the Blarney Senior team. Who would have thought that the 1966 Soccer World Cup in England would have had such a big impact on a young Blarney man? It was the beginning of an amazing journey and love affair with football, so much so that the following year, 1967, Con and his friends reformed Blarney United football Club. Con would go on to give over 50 years of unbroken service to the club as a player (only finally retiring after 52 years after many false dawns) and countless other roles in the club. He would see his beloved club grow from the grounds of Blarney Castle, to Pauds Cross, and many other locations before the club finally laid its roots in O’Shea Park in Tower as we know it today. His passion, loyalty, commitment, sacrifices and unbroken service to the club will never be seen again, and to this very day Con can still be found in the thick of things at Blarney United football club. Without a doubt Blarney United could not have become one of the top amateur soccer clubs in the country today without the hard work and dedication of Con O’Riordan and everyone was delighted to be able to honour him and celebrate with him on the day. Con even managed to score an unstoppable penalty on the day to win the game for his team, his trusty left foot has never left Con, or Blarney United down in 50 years ! Con, the O’Riordan family and everyone at Blarney United would like to take this opportunity to thank everyone who helped with Cons battle including family, friends, the doctors and nurses in the CUH and everyone at Blarney United football club for all the support, help and assistance.